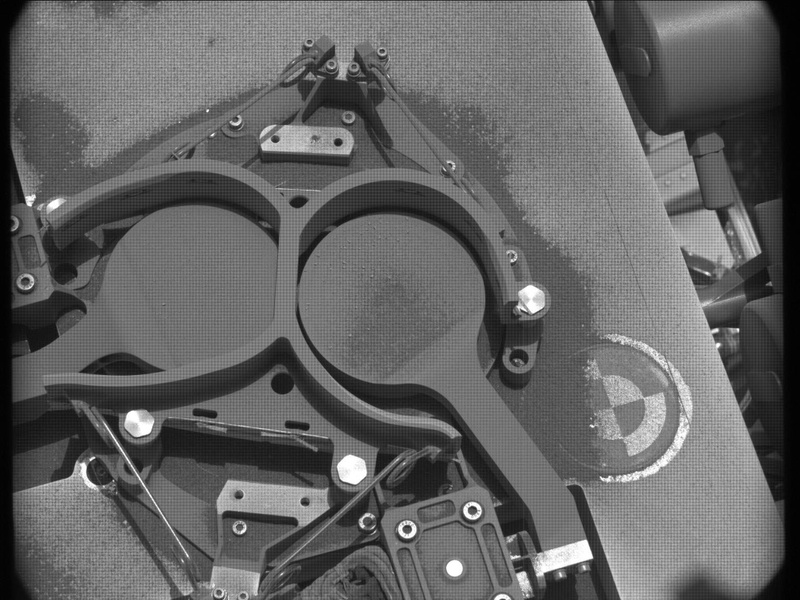 Mastcam view of the sample that was dropped off on the SAM inlet cover on the right-hand side of this image, to characterize portion size delivered by the drill. Although the cover looks quite "dirty," the difference in images taken before and after drop off reveals that only a very small portion of Aberlady material was dropped onto the inlet cover. After looking at our exciting new drill hole, "Aberlady," a few interesting observations were made: the drilled block lifted up a centimeter or two as the drill was retracted, there might be some evidence of a horizontal calcium sulfate (i.e. gypsum) vein within the drill hole, the drill went into the rock very easily (no percussion required), and the drill tailings look clumpier than usual. Some concern was expressed by instrument engineers and scientists that this outcrop may have penetrated into a weak underlying layer, precluding enough sample to make its way up into the drill stem for later drop off to CheMin and SAM. CheMin scientists were also planning to place the sample into a shiny new Mylar cell for this new and unique geologic unit, though are concerned not enough sample will be delivered for proper characterization. So, today the rover will attempt to drop a sample portion into a previously used (and shaken clean) CheMin Mylar cell to get a better understanding of what this material is made of, if enough sample is delivered. Based on the CheMin results, we'll either continue with our typical SAM analyses or make decisions on whether to proceed in a different direction, perhaps literally. CheMin is power hungry, so we only had energy for one more observation, a Mastcam Phobos transit.